About a week before the trip, all of our travel info showed up in shiny bubble envelopes. When we got to our hotel rooms, there was a package of goodies waiting. 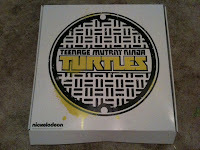 Inside included some snack food (green apple licorice, New York pizza-flavored Pirate's Booty), water, and a t-shirt. This was awesome, but it is rather large and would not fit in my simple carry-on luggage I had brought. Oh well, two carry-ons wouldn't be a problem. At the end of the big day, they gave us a poster tube and a USB drive in a pizza slice pouch. Very awesome, but the poster tube was also too big for my little carry-on luggage. Now I was up to three pieces of carry-on. Hmmm. But it all worked out - Since my flight was just on a little plane, they have to put the carry-on luggage down below anyways. So I only had to carry the box and the poster tube into the cabin, where they both fit in the overhead without trouble. Whew! Below is the one notecard of notes that I took throughout the day. It's not much - nothing here is really new from what I shared last week - and more than anything it just shows off my bad chicken scratch hand writing, but this is the stuff that stood out for me as being worth writing down. 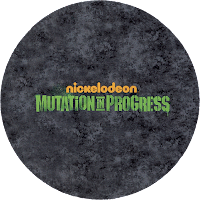 Remember: This is all still a Mutation in Progress and things could easily change before the final product airs in a year and a half. Eastman Theater - This is from the pilot animatic, where the theater April is waiting for the Turtles at had a giant sign naming it the Eastman Theater. Kevin Eastman, of course, is one of the co-creators of the TMNT. 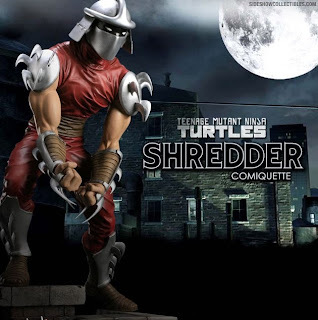 Shredder, Serious Business - Basically, expect Shredder to be a no-nonsense badass bad guy. April, 16, Peer - In describing why April has been redesigned to be 16, we were told it was to make her a peer to the Turtles, as well as to give the girl audience someone to relate to. 30 min - The running time of an episode (with commercials). Kinda a no-brainer. Comedy, Action, Mutation - What attributes we can expect from the new series. Deeper Storytelling, Mythology - Expect the background story to be revealed slowly in parts instead of all at once and for a mythology to build throughout the series. 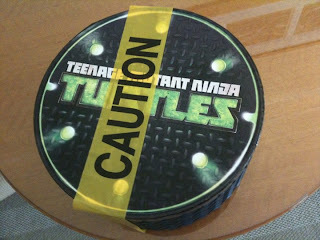 Kid Relatable - Expect the Turtles to act more like teenagers than they ever have before. CG Meets Anime, Comic Book Feel - The visual style you can expect to see from the show. Splinter, Human w/ Daughter - As mentioned last week, Splinter will start as the Human Hamato Yoshi who leaves behind a daughter (is she dead or alive? we have no idea) when he flees from Japan to New York. AI Chip in MP3 Player - This is what we saw in the pilot animatic. Less Than $6/Figure - Hey, looks like I remembered the $5.99 price for the action figures correctly. Hopefully Playmates can stick to this. In general, I'm very happy with what I've seen. I was really surprised to see the series using the comic books for as much of a source as it has. Something I was not able to get across well in any of my posts is just how funny the pilot was. Not the slapstick humor a lot of you are afraid of, but just really funny banter between all of the characters. The biggest question marks will be how the final CG ends up looking and how April's character changes are integrated into the story. Another area of concern I had, which I haven't really made mention of, was the fear that Michaelangelo would be written as the stupid little brother, instead of a regular goof. In the pilot I thought he was just perfect; I just don't want to see his character degrade into stupidity like he did in the 4Kids series. 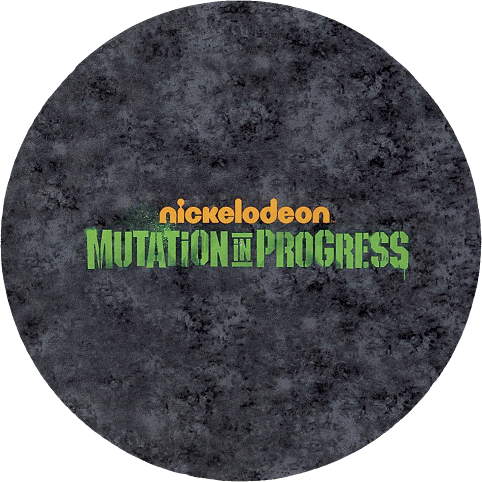 But otherwise, I think we're in for a real treat - something better than could have ever been possible had Peter Laird not sold the TMNT rights to Nickelodeon. The Playmates presentation part of the Fan Preview Event ended up being far more elaborate than I could have ever imagined. To set the scene a bit, I'll attempt to describe the room we spent most of the day in. The room was actually a "gym," with a basketball court floor. For the event it had been converted into a presentation room. Green lighting, which illuminated Nickelodeon's new Teenage Mutant Ninja Turtles logo on the floor, contrasted the overall dark atmosphere. At the front of the room was a table built from two large metal barrels, from which green-colored "ooze" made of spray foam was leaking, and a glass top. The 12 fan attendees sat front and center on an array of chairs built from skateboards (very neat looking, but they did force you to sit with good posture!). To the right of us were some more (non-skateboard) chairs where the Playmates guys and some Nickelodeon executives sat. There were even more people standing in the back of the room, including more Nickelodeon people, people from the PR agency that helped coordinate the event, and other who didn't ever say anything (they could have been the focus group people). Whatever the case, we were being constantly watched by a lot of people. But back to Playmates. Their presentation started with a slide show. The slide show was kind of boring, as it was basically a bunch of numbers about the awesome sales history of Playmates' TMNT toys through the years. Basically, they've sold a crap load of toys. Well, I knew this and I wasn't sure why they were telling all of us this, since it seemed more aimed at potential retail buyers or other business people of that sort. But then the slide show ends and they tell us to turn around and WHOA the wall that had been the back of the room is opening up to reveal even more of the room and a full display of toys along the new back wall! Impressive. Most impressive. As I said in my first report of the event, I really wasn't planning on seeing toys. Not to this extent, at least. The entire back wall (the real back wall) was a massive display of toys. In the middle was completely new stuff, while the sides had some of the old toys on display. This included a diorama that showed the evolution of the basic Turtle figure through the years - a nifty thing to look at, but the unreleased Mirage Turtle at the end of this display made me laugh inwardly. Now to the meat of the display - all the new stuff! On display were basic Turtles, "deluxe" Turtles, the new Turtles' Sewer Lair playset, role play toys, several vehicles, and more. Let's go through all of these individually. Basic Turtles - OMG these are awesome!! I am not going to be able to do them justice in words. IIRC from the slide show presentation, the scale of these figures is between 4"-5". Before this event I was thinking that I would only be interested in new figures if they were in the 3.75" scale, but going slightly taller on these actually works perfectly. The Turtles prototypes were fully painted and each Turtle was a 100% unique sculpt - no use of identical bodies with just different heads here. The detail and paint and just the general look of these was amazing. Other Basic Figures - Also on display was the unpainted Shredder prototype. Even unpainted he looked amazing! This also has potential to be the best Shredder figure ever. Unfortunately, Splinter was in a much more early development stage and I don't think he reflected what we will see with the final figure, so I have no real judgment on him. These six figures will probably be the entirety of the first wave we see hit stores in August 2012. An April figure would likely come in wave 2. Oh, and I think they said the price point was going to be $5.99, which is quite impressive. Deluxe Figures - I don't think the Playmates guys actually called these "deluxe" figures, but they are the higher price point figures. The ones on display were in a really early development stage, and they asked us not to talk about them in detail, so I won't. I will say, however, that in concept, I hated these. It is just more of their standard "put the Turtles in wacky costumes and give them an action feature" that I can't stand. Bleh. Mini Figures - These are a smaller scale, 2"-3", figure that sound destined for the European market (where apparently they love mini things). Only Leonardo was on display, but he looked very cool. I would buy it if it was sold here. Vehicles - So, it turns out that I completely neglected to talk about the new vehicles in my previous post with details of the new show. I'll make up for that now since all of the (revealed) vehicles naturally will have a toy version. I do not remember the exact names of these vehicles, so please keep that in mind in your conversations. Sewer Rail Glider - This is a converted train car that Donatello has retrofitted to be able to glide on the rails and also go top side to the street. The design for this is, in general, pretty cool. It kind of looks like a beefed-up party van/subway car hybrid with a paint job that seems to harken back to the old party van from the original cartoon. Playmates had a fully painted prototype on display and it looked to be a solid toy. I personally have no interest in buying vehicles, so I'm indifferent to it as a toy. Stealth Shell - I found this thing to actually be really cool, both as a toy and as an element of the series. Basically, this is like a low-riding recumbent bicycle (but motorized) that is covered by flat armor (shaped like a turtle shell), which camouflages the rider when looked at from above. Again, there was a completed prototype on display, which was really rather sleek. I won't likely buy it just because I don't buy vehicles in general, but I'd have no problem buying this one for a kid. Shredder/Foot Motorcycle - Nooooo, not more motorcycles! If there is something the TMNT line has had too much of through the years, it's motorcycles. So, as a toy this does nothing for me. As an element of the series, I think it'll be ok. As it was described to us, this thing is meant to be badass and loud. There's nothing stealthy about it - the person riding this wants to announce their arrival where ever it is they're going. The Turtles' Lair - This thing is huuuuuge! Probably between 3'-4' tall. In describing it in detail I'd have to describe the general look of the Turtles' Lair, which I think I would fail miserably at, so I won't. But it's really cool! The prototype on display was really, really impressive and detailed. However, it was literally built from parts bought at Home Depot. I don't know how this is going to translate to a finished mass market toy, so that is my only hesitation. As with vehicles, I have no personal interest in buying playsets, but I think a lot of kids will have some serious fun with this. Playmates also mentioned potentially releasing add-on modules in the upcoming years that would make the playset even bigger. Role Play - The role play toys on display were your standard colored bandannas and plastic weapons. I found it kinda weird how the masks had "eyebrows" sewn into them. I think they've tried to do this before, and I know the effect they're trying for, but I also think simple flat bandannas look better. 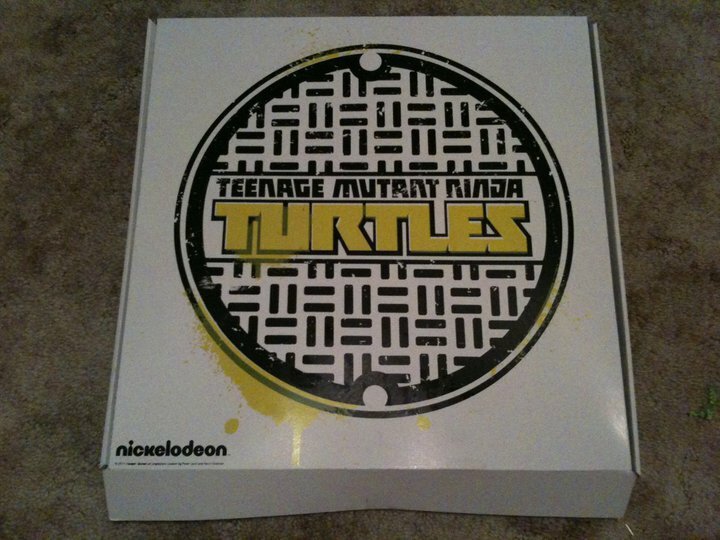 Classic Turtles - Oh yeah, that's right - classic Turtles. 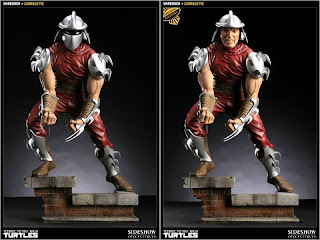 You know how there was never really any action figures that looked like how the Turtles looked in the old cartoon? Well, Playmates is ready to right that wrong. This line will be larger scale and with super articulation. The only figure on display was Raphael, and while he didn't look quite finished, he looked really cool. And although this line will start with the Turtles and maybe other standard characters, it sounds like there's potential to cover some of the more obscure characters. We'll have to see. And I think that's it! And looking back at what I just typed, it's quite a lot! Playmates did mention that they intend for the line to take up significant shelf space in stores. 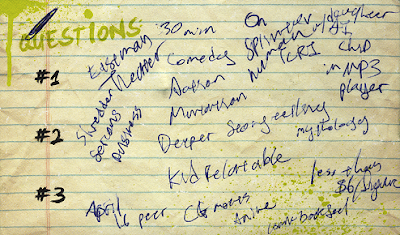 And this is just the start of it - coming in 2013 (tentative) there will be even more to go along with the new movie. And it sounds like they intend for that line to be completely new/separate from the Nickelodeon series stuff. In short - lots of stuff to look forward to! The episode started with the Turtles training with Splinter in their Lair. The Turtles' training evolves into an argument about whether or not they can go up to the streets. There is a lot of humorous banter between Splinter and the Turtles using the repeated line, "YES... and no." The argument ends with the Turtles not being allowed to go above. After training, Donatello presents the others with his newest invention: The world's most advanced MP3 player. He calls it the T-pod; it has a special AI chip inside it and can hold a bazillion songs. Mikey is in awe of it and slips the ear buds under his bandana, into his "ears." How many songs are actually on the MP3 player? Three. April stops by the Lair with some pizza, which they then eat and add to a chart of "Best Pizza in New York." April invites the Turtles to join her at the movies that night. Donatello is thrilled, as he has an obvious crush on her. 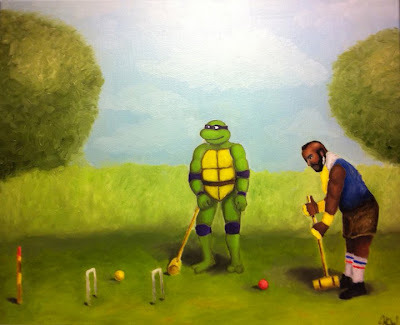 However, the Turtles have just been told they can't go to the streets, so it takes some persuasion of Leonardo to decide that they will all sneak out later. Cut to later that night and we see the Turtles sneaking out of the Lair. Mikey still has the T-pod with him. The Turtles reach the surface and start heading toward the theater. On their way, they come across a man wearing a weird metal "suit" trying to break into a building. The man is Baxter Stockman. The Turtles watch him for a bit, laughing at him because his attempts at breaking in aren't going so well and his "suit" is more clunky than it is intimidating. They eventually show themselves and beat him up, leaving him in a dumpster. Back in the alley, Baxter has found the T-pod, which Mike had dropped. He plugs into it and the AI chip empowers his suit, transforming it from clunky scrap and into super powerful armor. By the time the Turtles get back to the alley, Baxter and the T-pod are gone. The next day, the Turtles are hanging out in their Lair when April stops by. She shows annoyance at the fact that she was "stood up" the previous night. They are watching TV, and on the TV they see a news report about a man in a super suit attacking an office building. It's Baxter, and he's having revenge against the company that recently fired him (for being late, once). Awhile later, the Turtles sneak out again to find Baxter. When they do find him, Baxter proceeds to kick their butts in his now powerful suit. Eventually, Leonardo goes back to the bee hive they had run into the previous night, grabs it, and shoves it into Baxter's suit through the face mask. Baxter, who is completely sealed inside the suit, gets stung by many now-angry bees. The Turtles use the distraction to dislodge the T-pod from the suit, and it crumbles into the worthless scrap metal it started out as. The Turtles return to their Lair and a very suspicious Splinter. The drive up to San Francisco today was worth it, as it turned into a very productive day at WonderCon. 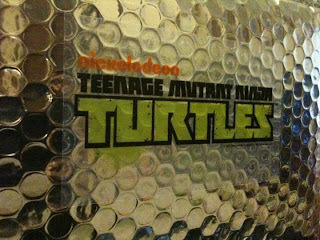 I went to the IDW booth mostly searching for Scott Dunbier, who was named as editor of the upcoming TMNT series with yesterday's announcement. However, when I saw someone at the booth wearing a familiar Nickelodeon t-shirt, I took a chance and started chatting with him. 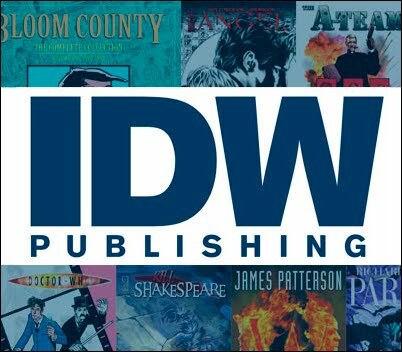 That man turned out to be IDW COO Greg Goldstein, who was then kind enough to sit down with me and answer some general questions about what we can expect to see from them in the upcoming years. Here's a summary of the questions asked along with their answers. Q: Will we see additional reprints beyond the first 11 issues? Yes, most likely, although the formats of the books may vary. I mentioned that there is high demand for a "City At War" collected book, and Mr. Goldstein responded very positively to that possibility, especially on hearing that it had never before been collected. Q: Does IDW have the rights to reprint the Archie comics? YES. Because those books are based on the [old] cartoon, the thinking right now is to hold onto them until the Nickelodeon cartoon starts next year, but he could be persuaded to start sooner if interest was high enough. Q: Will the new series be in black & white or color? Q: Will the reprints be in black & white or color? I only specified the already announced Mirage reprints with this question, so I don't know what answer would apply to the potential Archie reprints, since I'm assuming those would need to be recolored because of the story from Steve Murphy about how Mirage apparently let Archie throw them all away. Q: Will the collected books be available in bookstores/Amazon.com? I know that was a really stupid and obvious question and answer, but given Mirage's track record for not doing that, I had to hear a solid yes on this one. 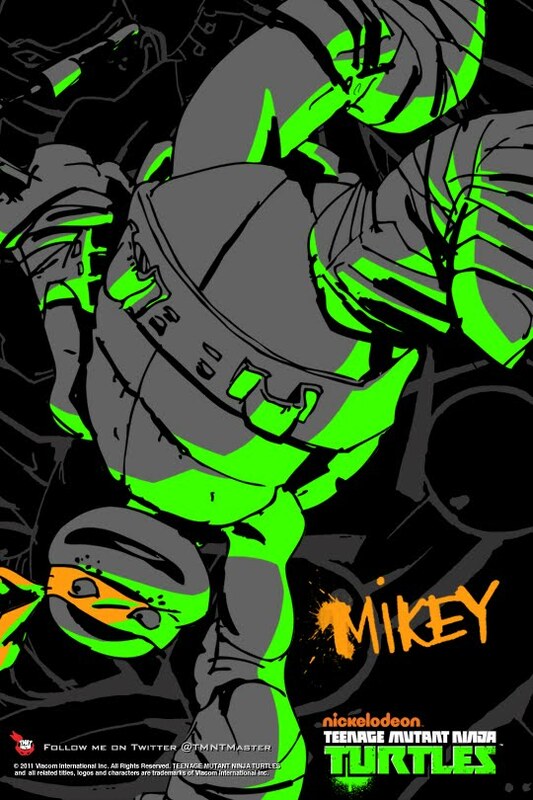 Q: Can we expect to see the TMNT be a part of IDW's digital publishing platform? Q: When can we expect to start seeing new material? There will be new material by the end of the summer. I think that last one was covered in the press release, but oh well. Consider it extra confirmation. And that was about it. I didn't really push for more information on the new series, because they had clearly announced everything there was to announce about it - so far - yesterday. However, it was a really positive conversation and Mr. Goldstein is clearly excited on a personal level about being able to publish new and old TMNT books and he intends for the title to be an IDW staple for many, many years to come. Naturally, the day I decide to skip out on going to WonderCon is the day of a big announcement. :p Just a short while ago, comic book publisher IDW announced at WonderCon that they have secured the comic book publishing rights for the Teenage Mutant Ninja Turtles. IDW's Teenage Mutant Ninja Turtles will kick off with an ongoing series this summer, featuring new and exciting storylines that also maintain the “turtle power” core beloved by millions of fans. In addition to the all-new series, TMNT fans will also be treated to newly remastered collections of classic Turtles comics, beginning with the original 1980s series that started this worldwide phenomenon. I'll give IDW a visit tomorrow at WonderCon and see if I can dig up anything more. I know I risk going against my non-disclosure agreement by revealing this, but it just seems too important to keep secret for a year and a half. During the visit to Nickelodeon a couple days ago, we were shown a lot of concept art and there was one piece of inspirational art that was clearly at the heart and soul of the entire series. Well, in an exclusive to Ninja Pizza, that piece of art has leaked to the web. I am proud to present that piece here and now, in all its glory.